We don't think Linn ever lost the taste for music that was embodied in Sondek LP12 turntable. But the last few years have seen much of the company's energies and resources devoted to the development of multichannel and multiroom capabilities, and this new Majik system marks a public 'return' to Linn's two-channel roots. 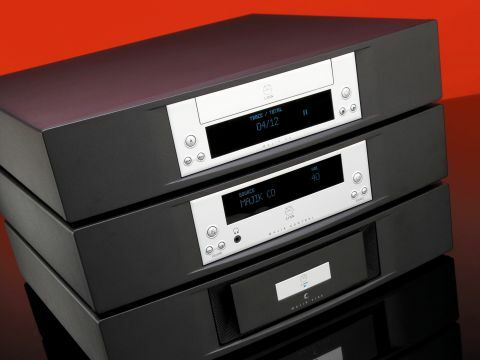 The three components involved in this system are all new, though all have engineering links to previous Linn components. The Majik CD player is a development of the Ikemi, with lessons learned with the top-of-the-line Sondek CD12. The Majik Kontrol preamp has its roots in the longstanding Kairn, but has also benefited from Klimax architecture. And the Majik 2100 power amp is based around Linn's patented Chakra output stage. All three components are compact and lightweight. The reason is that all three use Linn's proprietary switch-mode power supply, which operates at very high frequencies above the audio band and therefore needs only a small and light mains transformer. All three share similar casework and styling; with nicely bowed convex front panels with softened edges and corners, some 5cm narrower than 'standard' 43cm components. Our samples had dark grey matt casework, enlivened by a silver and slightly recessed central section. Fashionable all-silver versions are also available. Both the Majik CD and Majik Kontrol pre have decent size display panels and just six buttons; additionally the CD player has a frontloading drawer, while the preamp has a 3.5mm socket. The power amp looks rather different, with a grey central section with silver badge flanked by cooling vents that are also found in the top panel. All three have steel,wrap casework, perhaps parsimonious at the price. The Majik CD player is primarily intended for regular stereo CD replay, but it also supports a number of other two-channel optical disc formats, including CD-R,RW, DTS Audio, MP3 and HDCD. Other features are also very comprehensive. Socketry includes two pairs of analogue output phono pairs, optical and electrical digital outputs, plus Linn KNEKT and RS232 control sockets. All the usual disc navigation functions are available, though the scan only operates at twice normal speed. A wide variety of display and user-configuration options are also available. Although both may be operated via their front panel buttons, in reality, the supplied remote handset will be doing the work. Although usefully slim for one-handed operation, it's not a particularly inviting device, with more than fifty tiny buttons. Yes, it does support a range of products and it does all the necessary functions with a bit of practice; but, it's not ergonomically friendly. The Majik Kontrol preamp is the most complex component, partly because it includes the necessary socketry for integrating with Linn's multi-room KNEKT system, over and beyond its standalone stereo capabilities. As a stereo preamp, it has eight phono pairs, clustered rather too close together for some of the bulkier plugs around these days. Two pairs cover line and tape outputs, while the six input pairs provide for plenty of sources. One of these inputs allows re-positioning of an internal 'piggy-back' board for three alternative configurations - matching high output (MM), low output (MC) phono cartridges, or an additional line level source. Microprocessor control - via an elaborate series of menus and sub-menus - allows a huge number of user-adjustable features. Some are more useful than others, but all of them taken together make for a rather daunting prospect. To explain all the options would use up all the space available for this review. The short version includes a range of display options covering brightness, content, 'time out' and 'sleep'; inputs can be assigned names, selected directly and adjusted for relative volume; the rate of volume change, muting, maximum, relative headphone and start-up levels. Then there are numerous others, rather more obscure - indeed often very obscure - options, but most users will settle for the default settings here, but the sheer flexibility over the operation of the preamp will make it very handy in multiroom settings. Last comes the power amp. The Chakra output configuration consists of a central IC module surrounded by an array of bi-polar 'boosters' that come into operation as power requirements are increased. Of the three components here, the Majik CD player is the stand-out performer, delivering its music with fine pace and urgency and decent dynamic drive and enthusiasm. While it doesn't entirely transcend the innate artificiality of the medium, nor deliver the quietest backgrounds, it does communicate the musical messages with fine clarity and aplomb. Although most of the reviewing was done using the system as supplied, along with other line-level sources, the vinyl options were also explored and found to be well up to scratch. Using a Linn Sondek LP12 with Ekos tonearm, a Rega Exact moving magnet type performed admirably enough within the limitations of this type of cartridge. The internal sub-board was realigned and a Linn Akiva fitted to check compatibility and performance with a low output moving-coil device. This amply showed why demand for vinyl remains healthy. Direct comparison of LP and CD can never be entirely valid, because of the very different mastering processes involved, but sometimes it's irresistible. We compared both versions of Christine Collister's Love album, which clearly demonstrated the extra coherence, warmth and sheer humanity of the vinyl version, using an admittedly significantly more costly record player. The Kontrol's vinyl stage is clearly a facility that's worth taking seriously. One thing that particularly stands out, is that the overall character of the components of this system remains impressively consistent throughout. It has a bright, light and notably open balance, with a very dry, clean bass end that's unusually free from any thickening. Ian Wilson is Linn's principal design engineer in the company's electronics division. He was particularly closely involved with the Kontrol preamp and came up with the idea for its clever multi-purpose phono stage. HFC Linn is a strong proponent of switch-mode power supplies. Is this merely because their small transformers are less costly? IW Actually they're rather more costly to implement, because of all the extra high quality silicon (electronics) - the high-speed diodes and low impedance FETs we have to use. The reason we use them is that they make the products immune from variations in mains power. Our power amps will give a consistent specified power output across a mains voltage range from 90V to 264V, so they can cope with problem mains conditions anywhere in the world - even with the diesel generators used in yachts. What particular factors do you need to employ to use switch-mode supplies? The fast (75kHz) switching waveforms have to be completely isolated from the devices themselves, from the signal path and from the mains network. And, if you're good at stopping stuff getting into the mains, you're also good at avoiding it coming in and causing problems. You'll have noticed how many mains conditioning devices have appeared in recent years; these are completely unnecessary with our switch-mode supplies. What influence have your top-of-the-line Klimax models had on the Majik components? It's long been our policy to 'work down' the technology developed for our top models to those lower down the range. The architecture of the Majik Kontrol, for which I was responsible, is based heavily on that used in the Klimax Kontrol. And the lessons in clocking and data manipulation learned with the Sondek CD12 are found in the Majik CD. What is the best upgrade path for owners of the new Majik system? We've always recommended focusing first on the source components, so upgrading the Majik CD to a Unidisk 1.1 would make a lot of sense. It's not only a better CD player, it also handles SACD, which is significantly more transparent to the music than CD. Then you could go Aktiv, either with extra Majik 2100 power amps, or go for a multichannel Chakra model instead.